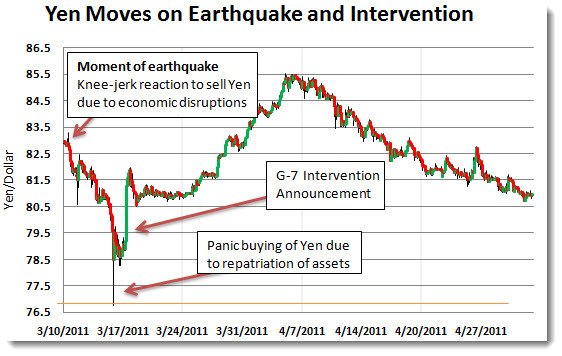 The Yen had been weakening after the G-7 intervention news in March. The commitment provided some nice relief for the Yen, but only for a short period of time. Since then, there has been no significant announcements by Japan that would support stimulus measures which would have been expected by now. The result is that the Yen is moving higher again as the risk trade is once again moving into “off” mode. The update to the chart above includes the most recent data, is shown below. 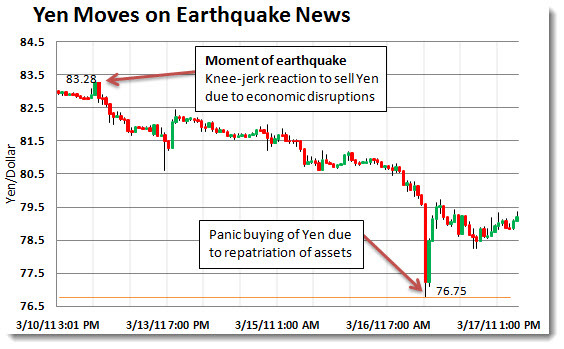 Notice that there is a slow and steady move by the Yen higher since mid April. Support appears to be close to 80 and it would not be a surprise that as the Yen approaches that area, another announcement of the G-7’s commitment to the currency weakening will be bellowed. The real question is whether or not that commitment will be backed by actions. And, it is not only the major currencies around the world that are looking stronger than the U.S. Dollar. For the most part, it is assumed that for the foreseeable future, the Fed’s effort will put pressure on the value of the dollar. This has provided a great deal of opportunity for carry-trades and other investments which borrow dollars to buy other risk assets. With such a great number of players on one side of the U.S. dollar trade (short), there will inevitably be an unwind. Analysts are expecting that it will be some time until that may occur as most are still viewing the dollar’s direction to have a neutral to negative bias. Therefore, unless there are extraneous shocks, the short-dollar trade may continue. The problem comes in when an unforeseen situation arises and the dollar is looked to as a safe-haven investment. That will invariably force a great deal of short covering and the ensuing unwind of risk assets will be an ugly affair. Already we are seeing some of that occurring within the commodity complex as the hint of any rate hike of discontinuance of stimulus appears to be creating a rush to cover one side of the carry trade. So far, the short covering has not been have pushed the dollar higher. If we do see a bounce from here though, it will be quick and painful for all the trades on the other side.